I have been working out for a few months now and have tried several other Vegan protein powders including the Vegan Blend and Brown Rice Isolate. 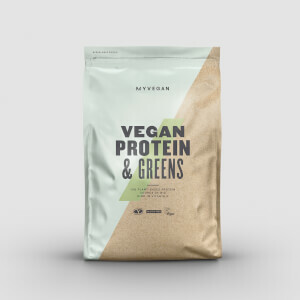 All I can say about this product is that it is the best protein I have ever tried. With the other products I would have quicker recovery and my muscles would not ache as much, with this one how ever I am like a son of Zeus reborn to bring his justice down upon the earth. After drinking this for merely one day I stormed into the gym and destroyed my workout. With each rep I let out a roar like a lion as the weights flew up and down like the waves of a violent storm. After leaving I had another shake and felt an immediate effect to my ego and power, so I ran out into the woods. Stripping my clothes off one by one I decided it was time to return to nature and live like a real man. I proceeded to hunt deer and other smaller mammals in the woods, feasting on their still warm corpses like a rabid zombie devouring his meal. On the fourth day I attracted the attention of a bear that was originally the top predator in the woods. He stood on his back legs and let out a vicious roar as he prepared to crush my frail, human body. Little did he know I had the Pea Protein Isolate effects surging through my veins and I leaped forward like a panther. My fist connected with a shattering crack and the bear simply imploded from the amount of power focused down my fist. I am now wearing his skin like a cape as I assert my manly dominance over my wooded domain. 11/10 - no other product will ever come close. "Isn't life already hard enough? ", I wondered after taking my first and very last sip of this stuff. The answer, my fellow animal friendly gainerz, is very clearly... NO. To those of you who gave this anything other than 1 star, may god bless you all. Clearly stronger and better men than I. The smell is exactly like flaked fish food. If that was the intention, then I applaud whoever works in the smell department over at MyProtein. A job well done. "UNFLAVOURED" – LOL The taste and consistency when mixed with water leave nothing to the imagination. Taste is offensive at best. Consistency is what I imagine wet cement to taste/feel like in the mouth. Still, if you're set on saving animals, the world and all its inhabitants in turn, i'd suggest just avoiding this protein entirely... Those poor peas died in vain. I was a protein powder virgin before trying this, (and not wanting anything animal based with the nasty additives & sweeteners) after much research I decided to give this one a go. Tried with water at first, and on its own it has a very savoury taste exactly lie you would expect if eating powdered dried peas! But second attempt I blended with a banana and water and to my delight the sweetness of the banana balanced the savoury taste of the pea! Now I have it every day with a spoon of peanut butter, organic banana and a spoon of flax seed oil - makes a great tasting thick shake and super healthy too! :-) Am keen to try the hemp powder next and mix in the same way…! Would recommend…! I like to think I can stomach almost any food but this protein has proved my nemesis. I tried it with absolutely every combination and gagged on most of them. For a while, I held my nose whilst drinking it with orange juice, but it got to the point where I dreaded my daily dose of protein. Just this week though, I have finally hit on 2 ways of mixing it which really work for me and don't taste in the least bit vile. 1) Mix with vegetable soup: you won't even notice its presence. And 2) Mix it with Nesquik banana milkshake powder in a 1:1 ratio and add water to mix: quite remarkably, this is actually pleasant to drink! My protein doesn't need to get tossed in the bin after all!! I can finally drink this for breakfast without pulling a lemon face. Morning coffee breakfast shake - gets you going - good pre workout too! 1 scoop pea protein 1 cup Almond milk (aldi) 2+ tbsp of xylitol (sweetener-BUT is good for your teeth - recommended by dentists- FACT) 1 tspn Vanilla essence (aldi) 1 tblspn flaxseed oil (trust me) COFFEE - properly filtered espresso is the best but instant coffee works well too-(aldi) Cacao powder - aldi - I use Raw cacao which is from Amazon (better nutrients topped up with Water - mix in blender (I have a nutrininja). NUTELLA SHAKE: 1 scoop pea protein 2 cups Almond milk (aldi) 3+ tbsp of xylitol 1 tspn Vanilla essence (aldi) 1 tblspn flaxseed oil (trust me) 30g (small handful) ROASTED hazelnuts-(aldi) Cacao powder - aldi topped up with Water - mix in blender (I have a nutrininja). DISCLAIMER: I don't work for aldi I just shop there because gainz are expensive. Overall good product but I deducted one star because on the website they say "gluten free" but on the pouch there is sticker which informs you that this produt is manufactured in a facillity that handles "gluten". 01/02/16 by POOR PEAS, POOR ME..
Great protein with good mixability, which helped me recover faster and gain lean muscle weight. I've never had an upset stomach with it, unlike some other proteins. Great value for money! As a vegan, to find protein which i can supplement my diet with, leaves me with few options. This protein source is not good on its own as a shake, however I have found it is a brilliant way to make soup full of protein. I make soup full of vegetables to get all the goodness with them, add one to two scoops of protein and then you have a meal with few carbs, lots of nutrients and high protein, which tastes awesome. The pea protein taste merely complements the flavour of the other vegetables, rather than trying to stomach it on its own. I also have Hemp protein mixed in with my porridge with some cinnamon which tastes neat, and a way to make one of the best complete proteins (hemp) taste good.